Rarely can anything taste so good and be so good for you. Dark chocolate is loaded with nutrients that can positively effect your health in seven key ways. The Good Stuff dark chocolate is primarily made from at least 60% organic cocoa powder, coco butter and sugar (milk chocolate packs more sugar and fat while white has nearly no health benefits). Dark chocolate contains soluble fiber and is loaded with minerals and antioxidants. The primary minerals in dark chocolate include iron, magnesium, copper and manganese accompanied by smaller amounts of potassium, phosphorus, zinc and selenium. The fat content is mostly saturated and monounsaturated with small amounts of polyunsaturates. It also contains caffeine and theobromine but in small amounts that should not keep you awake at night. 1. Powerful antioxidants (polyphenols) increase blood flow to the brain boosting smarts and memory. 2. The flavinoids contained in cocoa can protect against sun-induced damage, improve blood flow to the skin and increase skin density and hydration. 3. Epicatechin one of the compounds that lends cocoa its bitter taste lowers blood pressure. 4. Raises HDL and protects LDL against oxidation. 5. The same epicatechin can boost your cells’ mitochondrial function. Mitochondria are the organelles, little energy factories, found in the nucleus of every cell in the body. 6. Research has found the regular chocolate eaters were slimmer than those who abstained altogether. 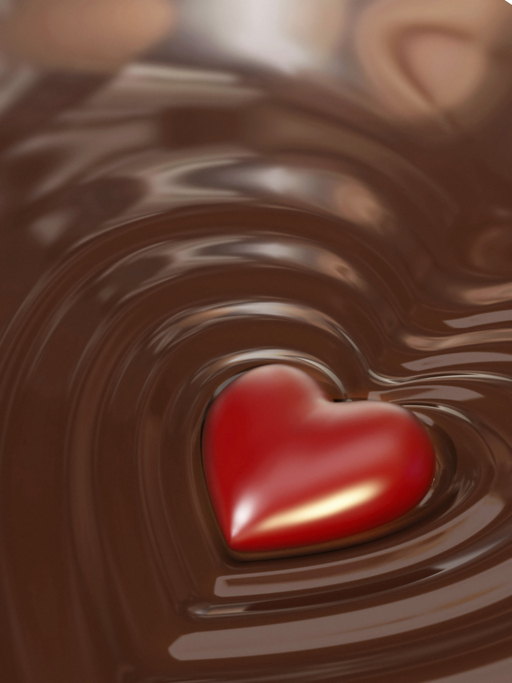 Chocolate satisfies cravings as it lights up your grain’s frontal lobe, its reward center. 7. Cocoa butter fats trigger natural endorphins (natural opiates) and serotonin (a mood modulator). These brain chemicals induce calm, decrease pain sensation, improve sleep and elevate mood.